From the complexity of various summer plans, we have finally settled on having two gatherings this month. The Open Houses will start at 2:00 pm. with a tour of the site, followed by discussion, a pot luck supper and a social evening. If you are coming for either of these events, you are welcome to stay over before or after, for a better look around, and perhaps, to help out with the projects at hand. The campground is always open for tents . 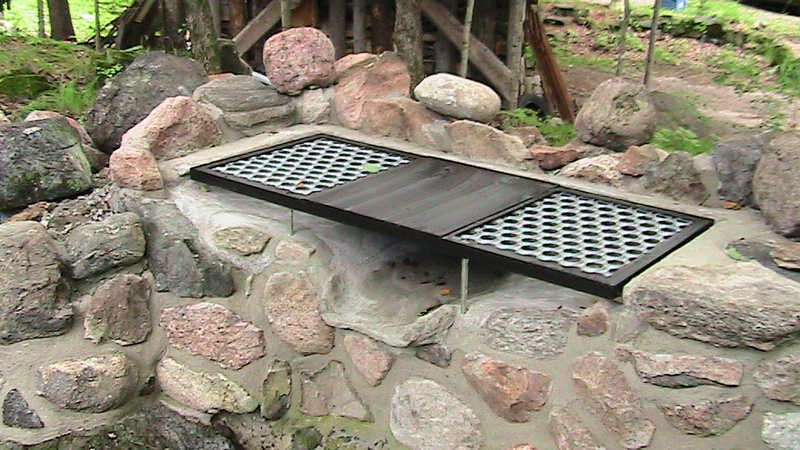 The new outdoor cooking facility makes it easier for campers. Please let Mike know if you plan on an extended stay. Its a good time to visit. The garden is booming! At our Children’s Camp (August 7th & 8th, 2013), we initiated two fire places. The first is a campfire circle and the second, a place for preparing food. We hope you can come and join us in imagining how we might build a settlement suitable for long-term well-being into the 21st Century. Let us know if you would like detailed directions. Looking forward to showing you around. Please let us know (phone or add a comment to our ride-share page) if you need a ride or could provide one to others.